Keeping Your Home or Business Safe - The best way to keep your home safe from dangerous levels of Carbon monoxide or CO that can cause carbon monoxide poisoning is to have a carbon monoxide detector or alarm. The United States CPSC or Consumer Product Safety Commission recommends that every home should have a carbon monoxide alarm or detector even if you don't have any fuel burning appliances. The CPSC also strongly recommends that consumers to have a professional inspection of all fuel burning appliances like furnaces, water heaters, stoves, fireplaces, clothes dryers, and space heaters, etc. A professional contractor will have the equipment to diagnose your furnace and evaluate its safety with an electronic carbon monoxide analyzer. A carbon monoxide detector or alarm is not a replacement for this service but a supplement to help keep you safe from breakdowns that can occur between inspections. Don’t let buying a CO detector create a false sense of security. Preventing CO before it forms is much safer than relying on an alarm. 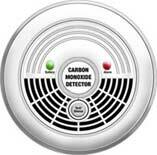 A couple of tips for buying carbon monoxide detectors will help you make an informed decision. First look for a UL certification on any detector you purchase. 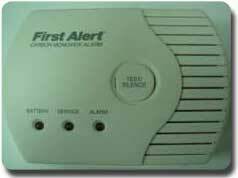 Also try to find a detector that alarms at low levels of CO to prevent long term exposure to low levels. Once you buy a detector carefully follow the manufacturers’ instructions for its placement, use, and preventive maintenance. The safety level for carbon monoxide as specified by the Health and Safety Executive is 50 parts per million (ppm). Between 50 - 200 ppm a healthy adult who is exposed will experience a slight headache within 2-3 hours. Between 200 - 400 ppm a frontal headache occurs within 1-2 hours, becoming widespread in 3 hours. Between 400 - 800 ppm dizziness, nausea, and convulsions occur within 45 minutes, and unconsciousness occurs in 2 hours. People suffering from heart or respiratory problems, infants, small or unborn children, expectant mothers and pets can be affected by CO poisoning more quickly than others and may be the first to show the symptoms of CO poisoning. If you experience symptoms that could be from carbon monoxide poisoning get all occupants of the house and get them to fresh air IMMEDIATELY. If someone in the house is suffering from CO exposure move the affected person to fresh air and give them oxygen if available. Contact medical help immediately. If the person is not breathing give them artificial respiration as taught in CPR Training until medical help arrives. If everyone is conscious and aware but the symptoms are still moderate to severe go to an emergency room and tell the attending physician that you suspect CO poisoning so it can be diagnosed by a CohB blood test and be give oxygen. If symptoms are mild open all the doors and windows if possible, turn off combustion appliances. Regardless of the level of the symptoms stay out of the house until it can be checked for CO. Call the EPA’s IAQ INFO Clearinghouse at 1-800-438-4318 or the Consumer Product Safety Commission exiting EPA at 1-800-638-2772 for more information on CO safety and other combustion gases.